Drawing on her research knowledge and clinical experience, internationally respected neurologist and mother of two boys Frances E. Jensen, M.D., offers a revolutionary look at the science of the adolescent brain, providing remarkable insights that translate into practical advice for both parents and teenagers. Driven by the assumption that brain growth was pretty much complete by the time a child began kindergarten, scientists believed for years that the adolescent brain was essentially an adult one only with fewer miles on it. Over the last decade, however, the scientific community has learned that the teen years encompass vitally important stages of brain development. Motivated by her personal experience of parenting two teenage boys, renowned neurologist Dr. Frances E. Jensen gathers what we ve discovered about adolescent brain functioning, wiring, and capacity and, in this groundbreaking, accessible book, explains how these eye-opening findings not only dispel commonly held myths about the teenage years, but also yield practical suggestions that will help adults and teenagers negotiate the mysterious world of adolescent neurobiology. Interweaving clear summary and analysis of research data with anecdotes drawn from her years as a parent, clinician, and public speaker, Dr. Jensen explores adolescent brain functioning and development in the contexts of learning and multitasking, stress and memory, sleep, addiction, and decision-making. 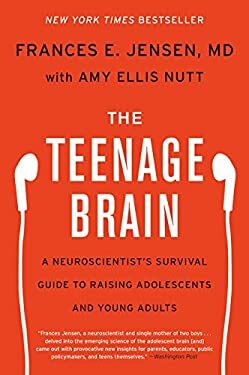 Rigorous yet accessible, warm yet direct, The Teenage Brain sheds new light on the brains and behaviors of adolescents and young adults, and analyzes this knowledge to share specific ways in which parents, educators, and even the legal system can help them navigate their way more smoothly into adulthood. "